Take a journey through some of the greatest examples of our country’s natural areas to connect with nature. 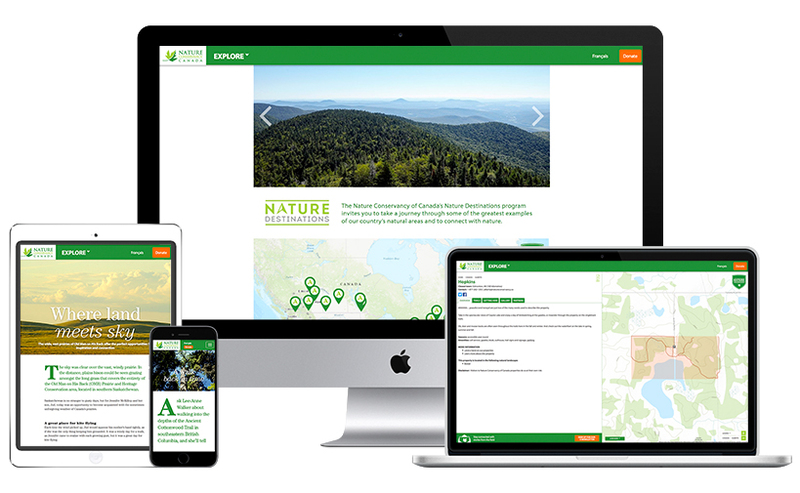 The Nature Conservancy of Canada’s (NCC’s) Nature Destinations program invites Canadians and the world on a journey through some of the greatest examples of our country’s natural areas. Nature Destinations is an invitation to connect with nature. From coastal estuaries in Atlantic Canada, to Quebec’s Appalachian mountain range, to the prairie grasslands and BC’s interior habitats, each Nature Destination offers opportunities to create unforgettable memories in Canada’s unique landscapes. NCC launched the Nature Destinations program in 2017 with 20 properties from coast to coast, with more to be added every year. Evermaven built a digital platform that combined immersive visual storytelling experiences with integrated mapping technology to allow audiences to discover and explore some of Canada’s most stunning landscapes. At the heart of the initiative was a celebration of our connection to nature. The Nature Conservancy of Canada is the nation’s leading land conservation organization, working to protect our most important natural areas and the species they sustain. Since 1962, NCC and its partners have helped to protect 2.8 million acres (more than 1.1 million hectares), coast to coast.